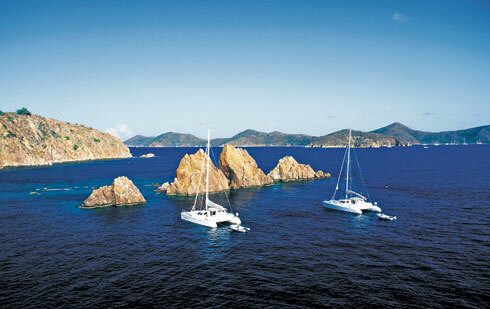 A perfect sail for your first day to get used to the boat - head out to the open water of Sir Francis Drake Channel, tack a few times, and you'll end up at the Bight on Norman Island that is well protected and offers easy mooring. Along the way to Norman Island, you can snorkel at the Indians - a series of rocks jutting out of the sea that offer great fish and marine life. When you arrive at the Bight, pick up a mooring ball. If you've arrived before happy hour, head around the corner in your dinghy to the Caves for snorkeling and then the Pirates Bight on the beach for sunset drinks. The new Pirate's Bight restaurant is excellent and reservations for dinner are warranted. If you're up for a big night, William Thornton "Willy T's", a great floating bar and deep fryer that will definitely get you in the BVI mood after your long travels (but this is not recommended for kids!). Sunset is best from the old restaurant.